Is Jason Akeson the Next P.A. Parenteau? In Jason Akeson’s second career shift in the NHL, in a meaningless regular season game in the 2012-13 season, he scored his first goal. The goal was a beautiful, bar-down shot over the shoulder of Craig Anderson. Scoring goals was nothing new for Jason Akeson, but scoring them in the NHL was. 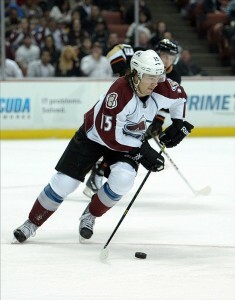 Before he made his NHL debut, he amassed 58 goals and 172 points over parts of three seasons in the AHL. Yet, Akeson had just received his first call-up. In 2010-11, Akeson enjoyed a breakout season for the Kitchener Rangers of the OHL. He tied for the league lead in points with Tyler Toffoli (108), and led the league with 84 assists. During that season, he was signed to a three year entry-level contract by the Flyers. Starting with his first year in the AHL, Akeson simply put up points. For the three seasons he was on the Adirondack Phantoms, he led the team in scoring, by margins of 28, 13, and 9 points over his next highest teammate. In Jason Akeson’s time in Adirondack, their offense has been dreadful. But, it would have been significantly worse without Akeson. He finished 10th, 22nd, and 34th in points in the AHL in his three years on the Phantoms. In those years, the Phantoms’ offense has been 2nd, 4th, and 9th worst in the league. He has had little to no help offensively in terms of quality linemates, but has continued to produce impressive point totals. Without him, it is entirely possible that they finish last every season. Without a doubt, Jason Akeson’s best asset is his vision and passing ability, making him a rare playmaking winger. 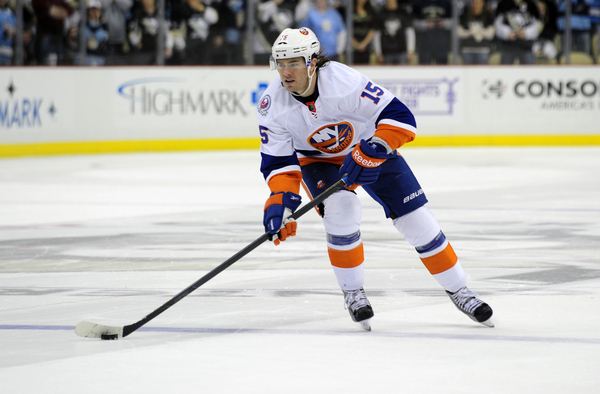 Outside of his passing ability, Akeson possesses a good shot, and is an okay skater. The reason everyone cites as to why it took him three seasons to make his NHL debut, despite his offensive exploits, is his play away from the puck. The label that Jason Akeson has always received is “top six or AHL” because of the perception that his game did not translate well to the bottom six, which is usually reserved for checkers and grinders. This is mostly due to his lack of size (5’10”, 190 lbs.) and “average” skating. With Philadelphia’s strong depth at forward, there wasn’t exactly a plethora of opportunities for Akeson. However, in the 2013-14 playoffs, coach Craig Berube defied conventional wisdom, and placed Akeson on the Flyers’ third line alongside two-way extraordinaires Matt Read and Sean Couturier. The results were quite the surprise. In Game 1, Jason Akeson became the scapegoat when he took a costly double minor for high sticking, on which the Rangers scored twice. But outside of that unfortunate mistake, Akeson was one of Philadelphia’s best players. 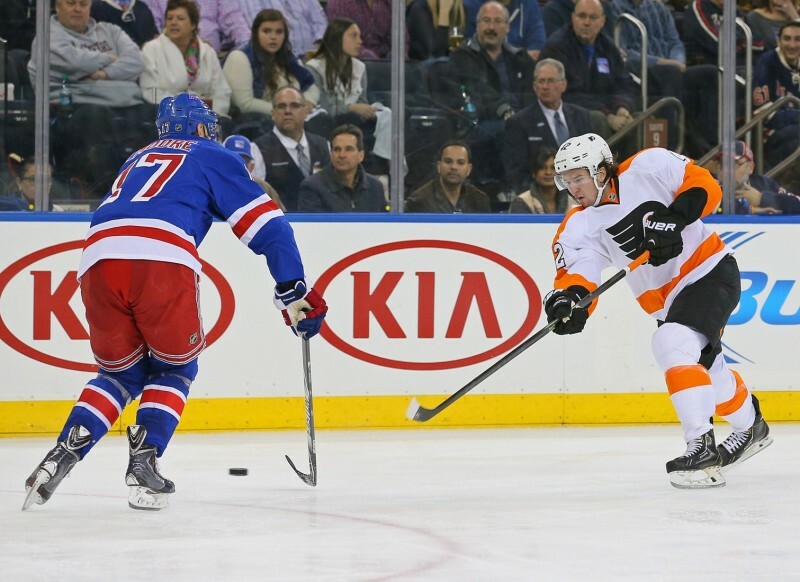 He was the only Flyer that was not on the ice for a single Rangers scoring chance. Although the Flyers would go on to lose in 7 games, Akeson would enjoy a successful series. He scored two goals and an assist, and had very strong underlying possession numbers. Playing tough minutes on the Flyers’ shutdown line, Akeson did not look out of place. Using advanced statistics with small sample sizes can be misleading, but Akeson was the second best forward on the Flyers in terms of possession in the series, and the eyeball test said the same thing. His supposed lack of speed did not appear to be a problem, as he hustled up and down the wing, paying close attention to his defensive responsibilities. He’s not a burner and will not win any Selke Trophies, but his play away from the puck was solid. When determining what Akeson’s potential ceiling as an NHL player should be, P.A. Parenteau is a perfect comparable. Their career paths and playing styles have been remarkably similar thus far. They are both right wings, on the smaller side (Akeson is 5’10”, 190 and Parenteau is 6’0″, 193), and are predominantly playmakers. The similarities do not end there. Both have endured a long, storied developmental path. Parenteau was a 9th round pick, 264th overall, in 2001 and Akeson was never drafted, instead signing as an undrafted free agent. From the beginning, the odds were stacked against them, and it took them a long time to reach the top. Parenteau’s time in juniors appears to be more impressive than Akeson’s, but the level of scoring in Parenteau’s QMJHL was much higher than Akeson’s OHL. In Parenteau’s 118 point season, sixteen players broke the 100 point mark and eleven broke the 110 point mark. In Akeson’s 108 point season, only five players broke the 100 point barrier and none scored 110 points. In terms of their production in juniors, it’s about even. In the three years both players were in the same league at the same age (21-23 in the AHL), Akeson amassed 172 points in 208 games, and Parenteau managed 169 points in 200 games. Parenteau enjoys a slight advantage in raw AHL points-per-game with .845 to Akeson’s .827. However, Akeson’s numbers are markedly more impressive. As mentioned previously, Akeson has been by far the major catalyst for the Phantoms’ offense. That was not the case for Parenteau. In his age 21-23 years in the AHL, Parenteau finished 5th, 3rd, and t-2nd among points on his team. He had the benefit of playing with far superior linemates compared to Akeson. The highest point total any of Akeson’s AHL teammates has had was 46 points from Denis Hamel in 2010-11. Parenteau had 3, 3, and 5 teammates equal or better that mark in his age 21-23 AHL seasons. If Akeson had the offensive help that Parenteau had, he very likely would have put up much bigger point totals. While it appears Jason Akeson could be bound for the NHL next season at 24, it took Parenteau much longer to reach the show. He got a 5 game trial at 23 with the Blackhawks, and played 22 games with the Rangers at age 26. Finally, at age 27 he broke in with the New York Islanders and exploded for 53 points his “rookie” year. In his past three seasons, Parenteau has been on pace to score 69, 74, and 49 points over 82 games. While Jason Akeson’s junior and AHL career has been comparable to Parenteau, it would be unreasonable to expect those point totals from Akeson starting next season. Parenteau has received very favorable zone starts, played significant minutes on the power play and even strength, and been on lines with John Tavares, Matt Moulson, and Matt Duchene. Akeson simply will not play that much, and with that quality of linemates yet for the Flyers due to their depth. However, if he is able to establish himself on the third line, he could work his way up to top six minutes and power play time in a few years. If he gets there, it would be reasonable to expect production similar to Parenteau’s over the past few years, around 55-60 points at his peak. For now, Jason Akeson should continue to work on his play away from the puck to earn the trust of coach Craig Berube. If he does, Akeson will be a valuable top six playmaking winger for the Flyers in a few years.